PA State Rep. Garth Everett - Have You Taken the Broadband Speed Test? The Center for Rural Pennsylvania, of which I am a board member, and its research partners at Penn State University are continuing to invite Pennsylvania residents to help provide that much-needed information by taking the broadband speed test available here. Your participation will help map broadband access in Pennsylvania, providing a valuable tool as lawmakers work to resolve this issue. 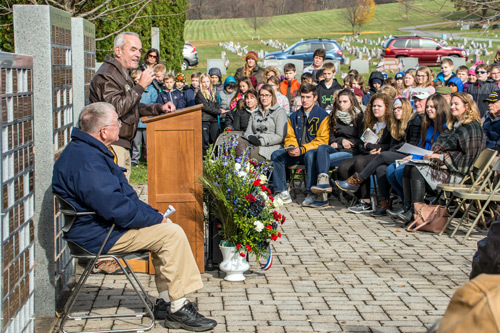 I was honored and humbled to attend the Veterans Service at the Montoursville Cemetery on Nov. 12 with local families and my fellow veterans. It was the experience of a lifetime to serve in our nation’s Air Force and I am blessed to continue to serve my community as your state representative. Thank you again to those who came to the service to honor our local veterans. Thank you to all those who have served our country. November is National Alzheimer’s Awareness and Caregivers Month, which serves as an optimal time to let people know that the Pennsylvania Department of Military and Veterans Affairs (DMVA) offers care for residents with memory loss at each of its six veterans homes. According to the Alzheimer's Association, dementia is a general term for a decline in mental ability severe enough to interfere with daily life. Alzheimer's disease, a type of dementia that causes problems with memory, thinking and behavior, accounts for 60 to 80 percent of dementia cases. Pennsylvania offers eligible veterans and their spouses six extended care facilities throughout the state that all provide memory care. Care at each home is administered by a clinical staff that includes physicians, registered nurses, licensed practical nurses, certified nursing assistants, pharmacists and registered dieticians. 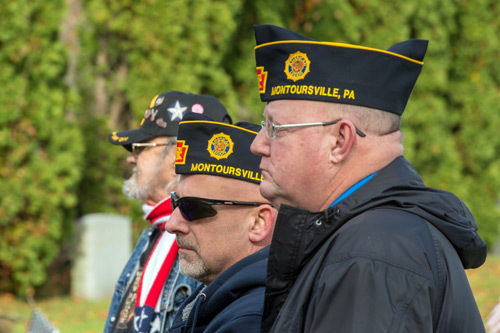 The six Pennsylvania veterans homes and their locations are: Delaware Valley Veterans’ Home (Philadelphia), Gino J. Merli Veterans’ Center (Scranton), Hollidaysburg Veterans’ Home (Hollidaysburg), Pennsylvania Soldiers’ & Sailors’ Home (Erie), Southeastern Veterans’ Center (Spring City), and Southwestern Veterans’ Center (Pittsburgh). More information about Pennsylvania’s veterans homes can be found at VeteransHomes.pa.gov. New to their respective leadership positions are House Majority Leader Bryan Cutler (R-Lancaster), Majority Whip Kerry Benninghoff (R-Centre/Mifflin), Majority Policy Committee Chairman Donna Oberlander (R-Clarion/Armstrong/Forest) and Majority Caucus Secretary Mike Reese (R-Westmoreland). In honor of the Thanksgiving holiday on Nov. 22, state offices will be closed on Thursday, and my office(s) will also be closed on Friday, Nov. 23. PennDOT Driver License Centers will also be closed Nov. 22-23. If you are traveling, be sure to check 511pa.com for the latest traffic and weather information. Drive Safe During the Holiday! Drunk driving-related crashes spike during the Thanksgiving holiday season. According to the National Highway Traffic Safety Administration (NHTSA), from 2013 to 2017, more than 800 people died in alcohol-impaired driving crashes during the Thanksgiving holiday period (6 p.m. Wednesday to 5:59 a.m. Monday), making it the deadliest holiday on our roadways. It’s a deadly holiday for crashes in Pennsylvania also. In 2017, there were 396 impaired driving crashes that resulted in 10 fatalities during the Thanksgiving holiday. This time of year, there is also potential for inclement weather. Check the forecasts before heading out, do not drive aggressively, always wear your seat belt, avoid distractions and never drive impaired. Have a safe Thanksgiving!